Israel has once more sent out a message to the Islamic and Arab world with its onslaught on Gaza that the struggle for the Middle East will be uncompromisingly bloody and violent. It was the same message in the summer of 2006 with the invasion of the Lebanon, with the Qana massacre of 1996, with the invasion and the 18 year occupation of the Lebanon in 1982 to 2000, and all the way back to 1948. For those who abjure violence in their personal lives, and for those, like me, who have never carried or used a gun, the boycott campaign is an important tool of nonviolent struggle against the Occupation of the West Bank, and the racist polity within the ever shifting borders of Israel, the borderless state in Occupied Palestine. I admire Hamas’ and Hezbollah’s armed resistance against overwhelming force, but it should be by now clear after sixty one years that by itself armed resistance to Zionism will not lead to its overthrow. The most these organisations can do to Israel is harass, with as much impact as a wasp stinging a human being. This in itself is not negligible. The main effect of the missiles launched over Israel’s border is psychological terror, and occasional fatalities, against which the fourth most powerful military machine in the world is powerless. Psychological terror may discourage new Jewish immigrants from arriving in Israel, and that is to the good. However such tactics do not even elicit a pause from Israel’s political leadership, Right and Left, in the ongoing war on the Palestinians, the Zionist project of clearing the land of Arabs, and the continued illegal settlement by Jews of the Palestine’s West Bank. Clearly Hamas and other resistance organizations are quite powerless by themselves to stop Zionism in its tracks. In a defensive struggle the Shi’ite organization Hezbollah did succeed in throwing the IDF out of Lebanon in the year 2000, and successfully frustrated Israel’s attempt to reoccupy the Southern Lebanon in 2006. Israeli expansionism was thus contained. At no point in the last sixty-one years have Arab armies succeeded in crossing Israel’s 1967 borders, or even in invading the annexed West Bank. Israel’s wars, including that of 1948, have been fought on the territory of other countries. The Yom Kippur War of 1973, although a partial defeat for the Arabs, did eventually lead to the return of the Sinai to Egypt (under American pressure) during the Carter administration. The regional military balance has been shifting in Israel’s favour for the last sixty years (Ref. “Plowshares Into Swords: From Zionism to Israel” by Arno J Mayer, Verso, 2008). Talk of Hamas’ “victory” in Gaza in 2009 (http://news.antiwar.com/2009/01/18/hamas-leader-declares-victory-in-gaza-war) is in my view self-deluding and misplaced. An unopposed massacre of over 1,400 civilians is not a victory. I do not want to see the Palestinian resistance reduced to the equivalent of the Native American “ghost dances” of the 1880s, as the last resistance of the aboriginal inhabitants of Palestine is vanquished. I do not think for a moment that this will happen, because the Palestinian Diaspora now numbers more than 7 million, but the weakness of the opposition to the Zionist colonisation of Palestine within Israel is very concerning, and a helping hand from an international citizens’ boycott of Israeli goods and services is its chief, but not its only hope. Arab resistance and Arab demography are other reasons for hope. Resistance as enshrined in the UN charter is legal; Israel is not, as the renowned Irgun terrorist Menachem Begin and future Israeli Prime Minister remarked the day after the UN vote on the partition of Palestine in November 1947: “The Partition of Palestine is illegal. It will never be recognized …. Jerusalem was and will forever be our capital. Eretz Israel will be restored to the people of Israel. All of it. And forever.” In order to be accepted as a member state in the United Nations, in 1949, Israel was required to endorse General Assembly Resolution 194, which recognizes the right of return of the Palestinian refugees and commits itself to the return of all “the refugees wishing to return to their homes and live at peace with their neighbours” (700,000 in total at the time), to its sovereign territory. Israel accepted, was made a member state and immediately after announced it had no intention of implementing the UN resolution. Israel thus announced its illegitimacy as a member state of the UN. The Security Council, dominated by the imperialist states of the West, who helped to implant Israel in the Middle East in the first place, went along for the ride. Israel’s key vulnerability lies in its being a trading state with a highly skilled workforce but few natural resources. 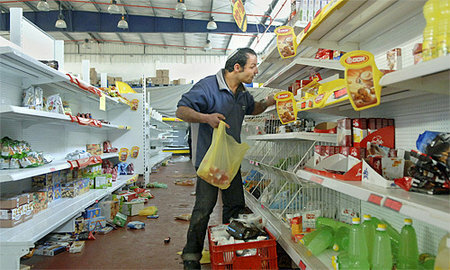 The boycott of Israeli products, coupled with divestment in Israeli companies and a cultural embargo has to be a key way of supporting the Islamic and secular Palestinian resistance (PFLP), as well as a way of applying pressure to the Zionist establishment to moderate its penchant for atrocities, encouraging dissent within Israel and the deepening of existing fissures within Israeli society. If an international boycott can be linked to the issue of the Right of Return for the Palestinians and the cancellation of the Jewish Right of Return, an uncontroversial strategic goal in support of the Palestinians can be flagged up for the movement. In January 2009 479 Israeli citizens signed a document called “A Call From Israeli Citizens” (at www.kibush.co.il) calling for the boycott of Israeli products, divestment from and sanctions against Israel as the only way forward to begin the Civil-ization (in both senses – demilitarisation as well – Occupied Palestine to become a civilian society once again rather than a garrison state) of the Zionist military machine and stop the ongoing war on the Palestinian population. In the 1980s Meron Benvenisti, an Israeli writer and the ex-deputy mayor of Jerusalem, ran the West Bank Data Project, which analyzed the interaction of the Israeli and Palestinian economies in the Occupation. The resulting study concluded that the West Bank had effectively been annexed by Israel, not merely occupied (Ref: Intimate Enemies, Jews and Arabs in a Shared Land, 1995). As pre-1967 Israel was also an annexation by military force, accompanied by some strong arming of Truman and the infant United Nations by Zionist elements in the American Jewish community, the term “Occupied Palestine” correctly refers to the whole of the land between the river Jordan and the sea. Any other designation fudges the evidence, which suggests that the military occupation of the West Bank will remain until the post-1948 colonial regime itself is either brought down or collapses under the weight of its own internal contradictions, to be replaced by a non-colonial political order and the re-establishment of political and economic equality between Arab and Jew. Before 1967, Palestinian civilians of Israel also lived under a military occupation, and were in a similar position politically to those of the West Bank and Gaza now. The Palestinian American writer Rashid Khalidi uses the term “helot” (a term from the Greek of Ancient Greece to designate an indeterminate status between that of a slave and that of a citizen) to designate the position of Palestinian civilians who have neither civil rights nor any political opportunity to influence the behaviour of the state that dominates and controls their lives in endlessly demeaning and demoralising ways. Those who do not like equality before the law and citizenship for all will leave, just as the Algerian French did together with some of the pieds noirs in 1962, helping to solve the problem of housing some of the Palestinian refugees from Occupied Palestine at a stroke. Frantz Fanon’s two most important books, Black Skin, White Masks, and The Wretched of the Earth, have now been translated into Hebrew (2004). I am sure that they have been available in Arabic for a long time, but the political culture of the Hebrews is backward and inward looking, which is to be expected in a colonial state. Were the champion of the Algerian liberation struggle Fanon alive today (he would be 82 years old) he would certainly support the Palestinians. It is our privilege and duty as free citizens of the international community to do the same. Paul Grenville 1st April 2009.